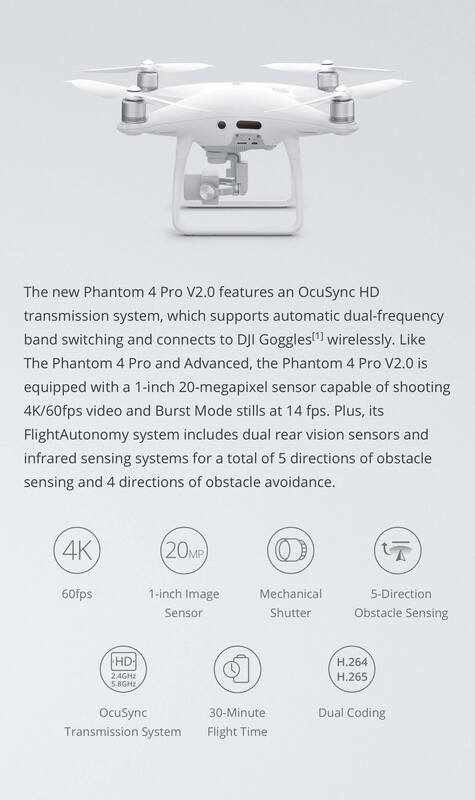 The Phantom 4 Pro V2.0 uses the same camera as the Phantom 4 Pro and is equipped with a 1-inch 20-megapixel sensor capable of shooting 4K/60fps video at 100Mbps. 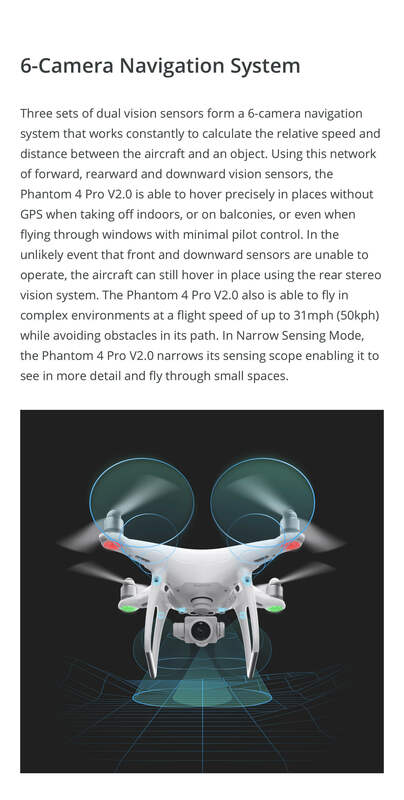 Also, like the Phantom 4 Pro, V2.0 features a 30-minute maximum flight time and 7-kilometre long-range control. 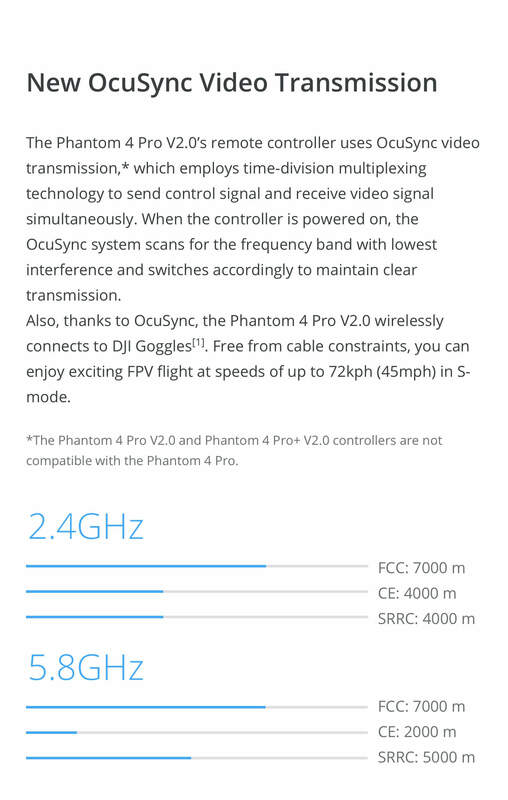 The remote controller of the Phantom 4 Pro Plus V2.0 also supports 2.4 and 5.8GHz frequency switching, and the remote controller comes with a with a built-in screen. What do you need for incredible aerial imaging? A brilliant camera with the intelligence to make every shot cinematic. 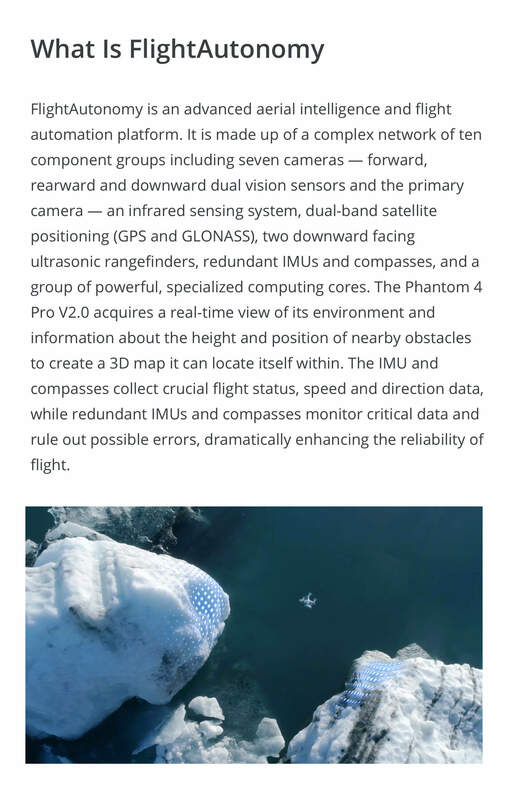 An undisputed market leader, the P4 Pro is the most recent version of the Phantom, with incredible cameras for professional videography, including intelligent sensors to track and record subjects as they move. 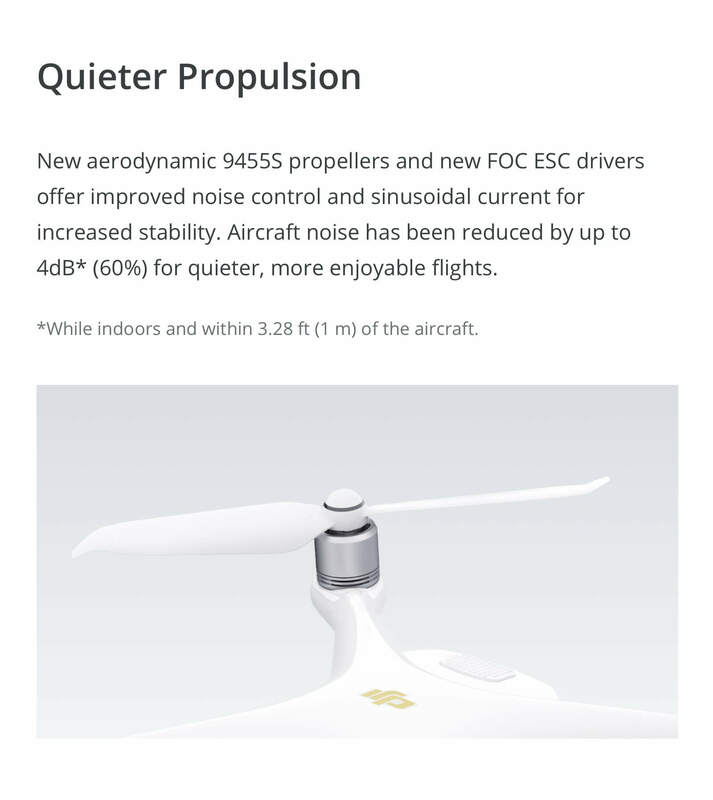 The Phantom 4 Pro is the newest Phantom 4 series drone on the market and it's an innovative wonder which has taken the market by storm. Its design is not only elegant and sleek, but it packs a punch where it counts (the camera!). 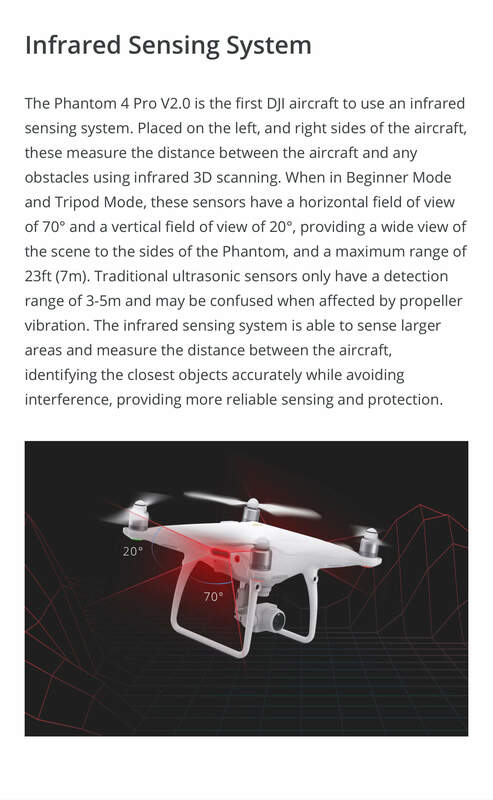 One of the big additions to the Phantom 4 Pro is the 3D internal hardware which constantly maps out its surrounding area in a 3 dimensional space. By doing this, the drone is able to stay constantly alert to its surrounding and any obstacles that it may need to maneuver around before its too late. Very smart indeed. The next big addition is the upgrade to the camera. 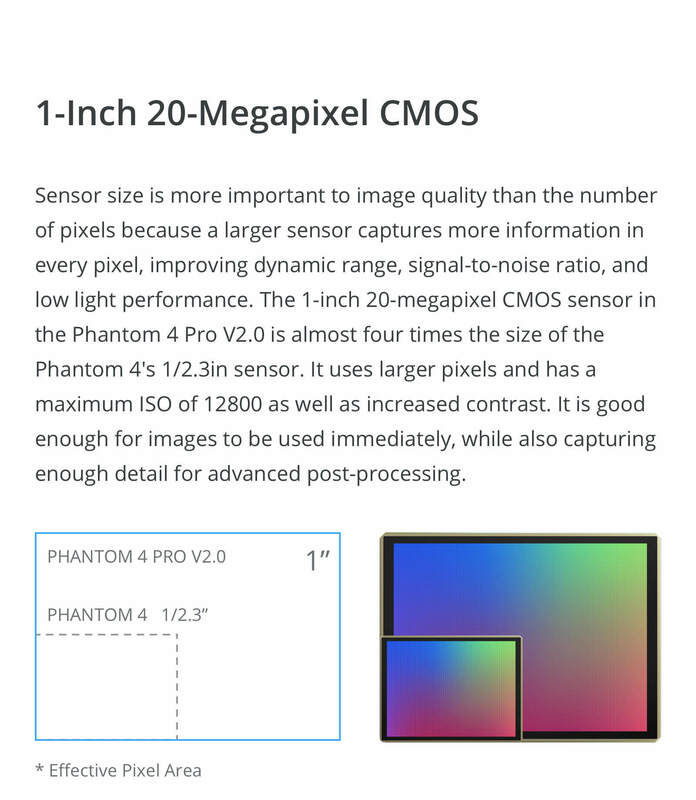 The Phantom 4 Pro now boasts a huge 20 mega pixel camera which utilises a full 1” sensor. The camera produces amazing photos and videos. Its ability to capture a large dynamic range is incredible, as it enables you to capture those intricate details you couldn’t capture before. 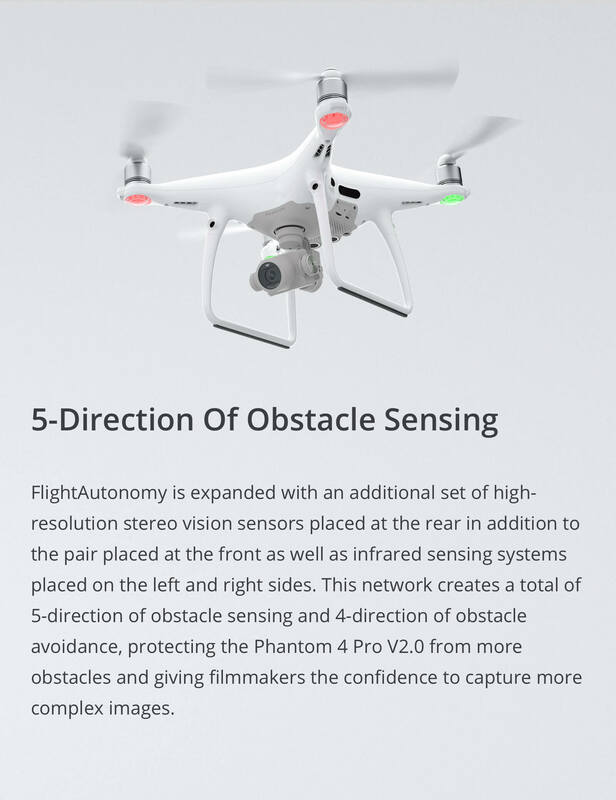 Another great addition to the Phantom 4 Professional is the ability to change the camera’s aperture settings on the go. Previously, the aperture was pre-set on all of the Phantom series drones, limiting your ability to get the perfect shot. 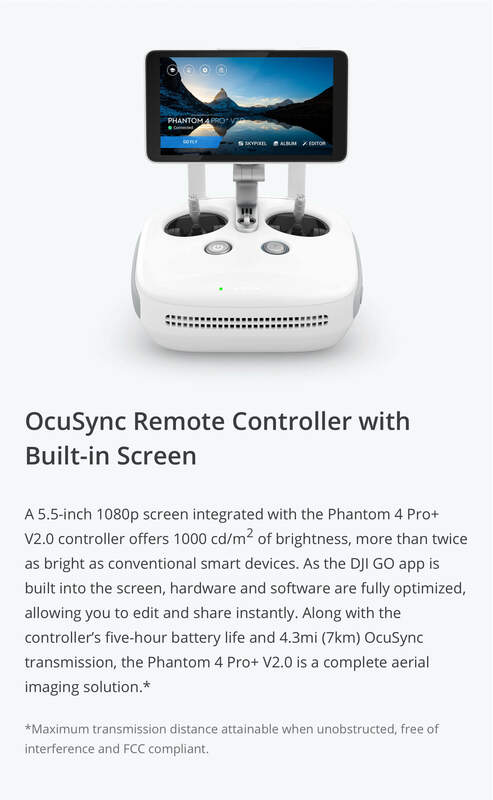 The difference between the Phantom 4 Pro and the Phantom 4 Pro + is the addition of an in-build 5.5 inch screen on the controller. It utilises the Crystal Sky display technology which is incredibly bright. It’s so bright that there is nothing on the market that comes close to its brightness at the moment. We highly recommend the screen to anyone who is thinking of purchasing it. You can use the display in direct sunlight with no issues at all, something you would have trouble with using a mobile device (for which you would need to purchase hood protectors to be able to see the display). 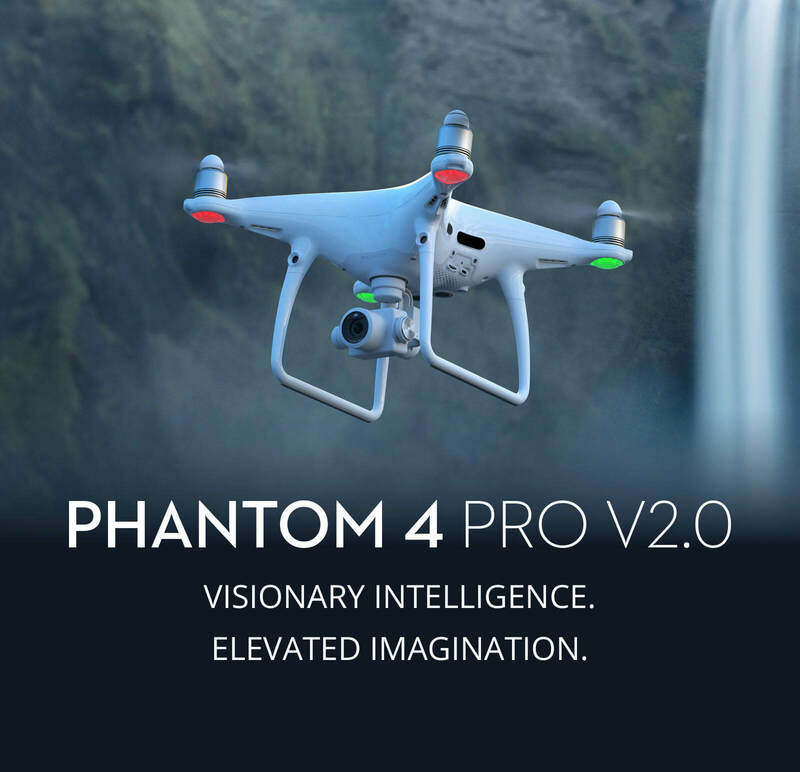 With increased flight time, a better camera and recording options, as well as increased safety features, and a new suite of Active Track and TapFly functions, the new Phantom 4 Pro is a real upgrade for any semi-professional photographers and videographers out there. 4K enabled with 20 mega pixel camera utlising a 1 inch sensor. Front, rear and side sensors. 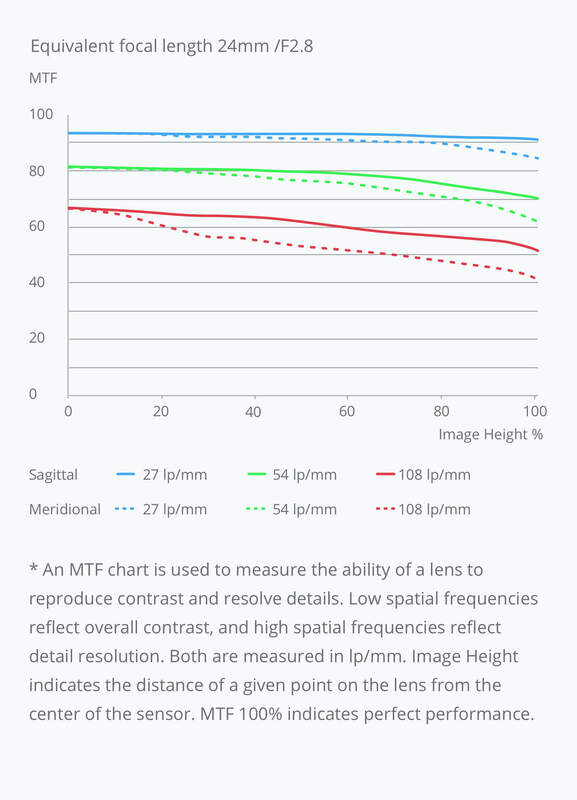 Ability to change aperture up to f11. Sports mode including a large amount of other modes to choose from. Live streaming to your mobile device. 5km range in the right conditions. Automated take off and landing. 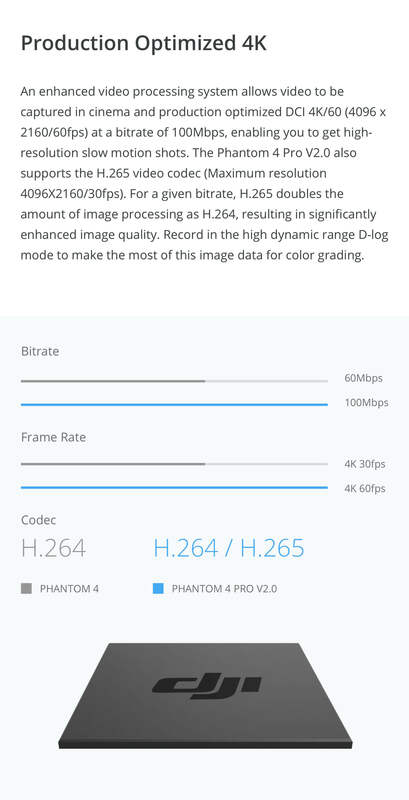 "Make no mistake, the Phantom 4 Professional is the best drone on the market for under 2kg. It is jam packed with technology that will last for years. You will not be disappointed. 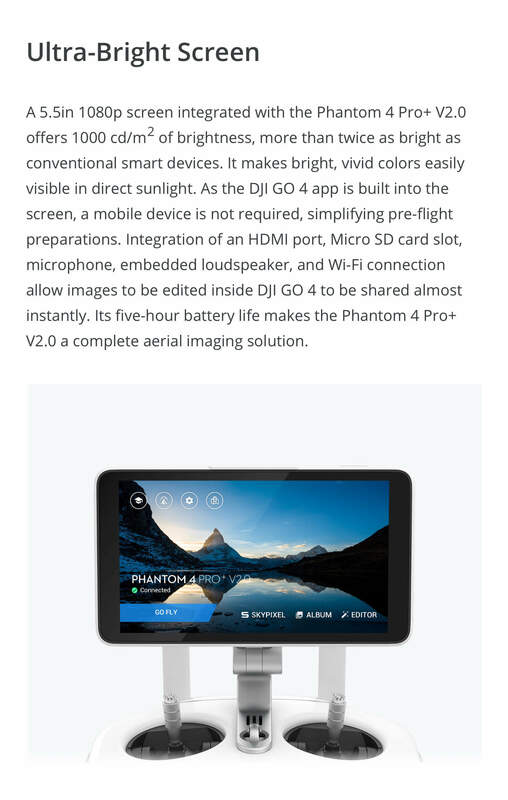 I personally use the DJI Phantom 4 Professional Plus and absolutely love it. Everything about this drone just works, from the dynamic range to the ability to change the aperture. It's a drone for everyone and I can not recommend it highly enough". We are a DJI Authorised Dealer in Australia so we can process basic warranty repairing, tech support and RMA evaluation on your behalf. Please contact support@crazyshotdrones.com.au for more information. Once a product is opened, all sales are final. For any unopened products, you will have 14 days to return the product with a 10% restocking fee. All returns require a RMA Authorisation Number - Contact us before shipping any product back. We offer Australia wide delivery. This product is eligible for FREE shipping. The Mavic Pro is a portable, powerful, easy-to-use drone featuring DJI’s most innovative camera and flight technology in a sleek, foldable package that enables creative fun wherever you go. * Mavic is now in stock and estimated delivery is between 3 and 7 business days. This piece of equipment marks a new era in technology for the drone world. With its unique folding design, the Mavic is so small it can fit inside the palm of your hand. We really like this drone as it’s very easy to use and set’s up in a matter of seconds. The biggest plus is obviously its size. It can fit in your back pocket and taken with you on your travels without any troubles. 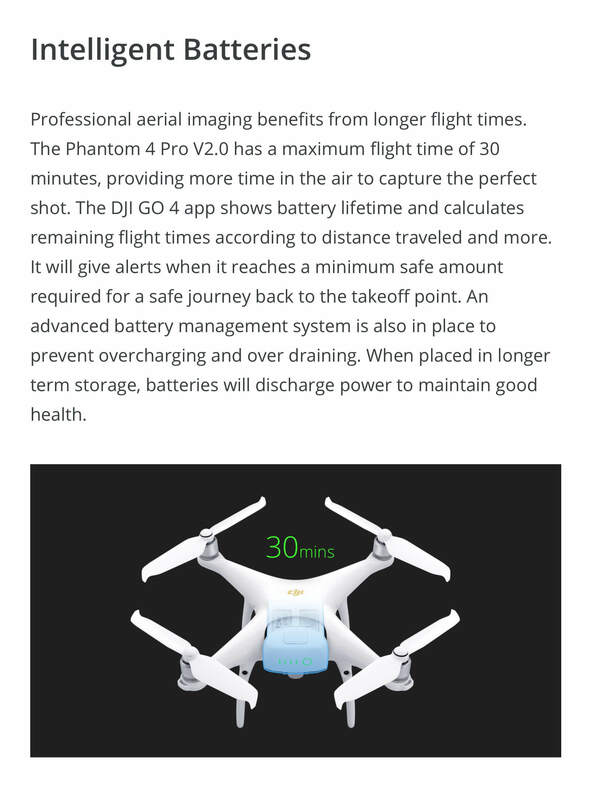 Compare this with the Phantom Series drones and you’ll be hauling a big backpack around. Although the Mavic Pro is small, it definitely doesn’t lack in camera quality. 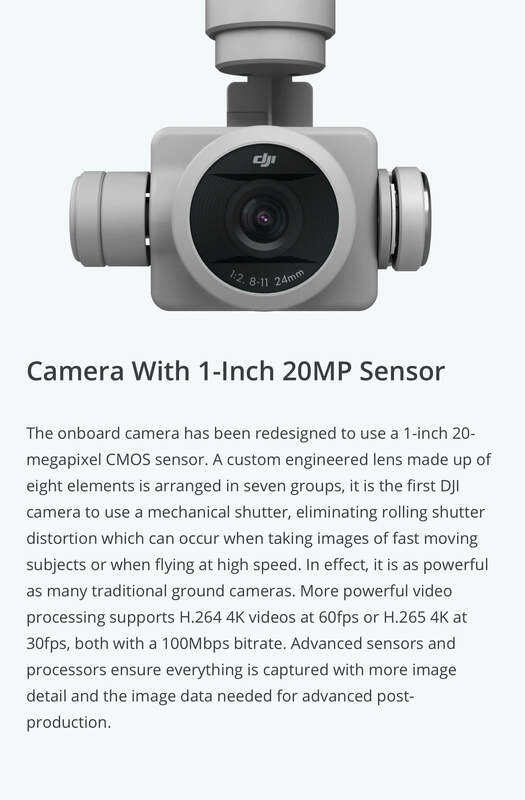 The Mavic boasts a 4k enabled 12 mega pixel camera utilizing a 1/2” sensor. The camera is basically the same as the Phantom 4 Series however, the Mavic's Field of View is narrower, which is a bit of a down side. "There’s a reason the Mavic Pro is so popular; because it ticks nearly every box a drone enthusiast wants, small, compact, easy to fly, great battery life and a good quality camera! I recommend the Mavic to everyone thinking of purchasing one. You’ll be pleasantly surprised how much punch they pack into such a tiny drone". NOTES: Restart the aircraft and remote controller after upgrade is complete. We offer FREE Australia wide delivery. Welcome DJI's new mini drone SPARK, a small, simple yet intelligent camera drone for beginners, designed to capture your life's moments whenever they strike. An unbelievably small and ultra portable drone with a great camera capable of shooting 12MP photos and 1080p videos, with quick and easy handheld takeoff, obstacle avoidance and an array of intelligent control options like gesture control and palm control. *Notes: The Spark does NOT come with a Micro-SD memory card. The Spark does not come with Remote Controller (see Combo for other options). Small and ultra portable design. 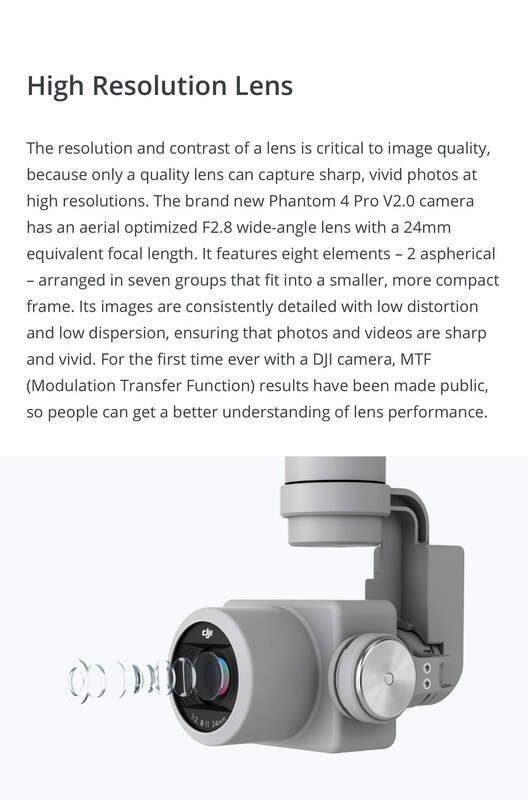 High performance camera that shoots 12MP photos and 1080p video utilising a 1/2.3" sensor and f/2.6 wide-angle lens with a 25mm equivalent focal length. 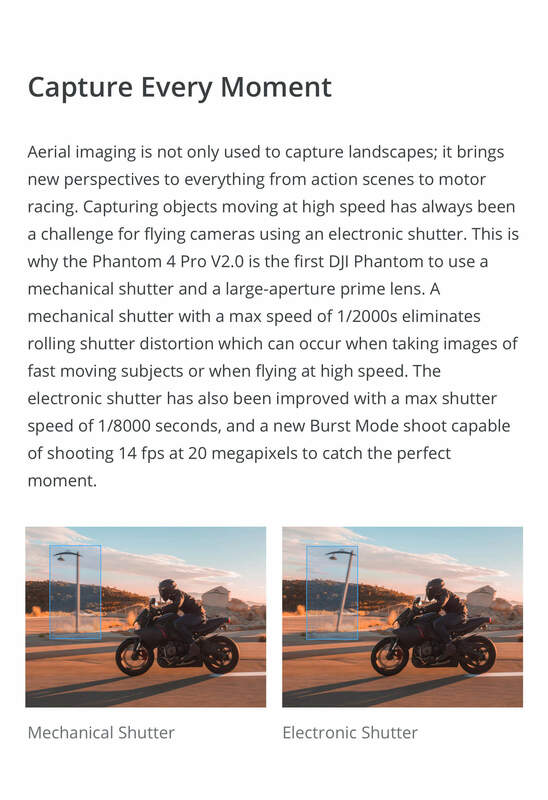 Multiple shooting modes incorporating Pano (to shoot horizontal or vertical panoramas) and Shallowfocus (to create a shallow depth of field with 3D technology). Obstacle Avoidance utilising 3D sensors. FPV flight immersion - The camera moves with you as you fly. Quick and easy launch - It takes off and hovers in place within seconds. 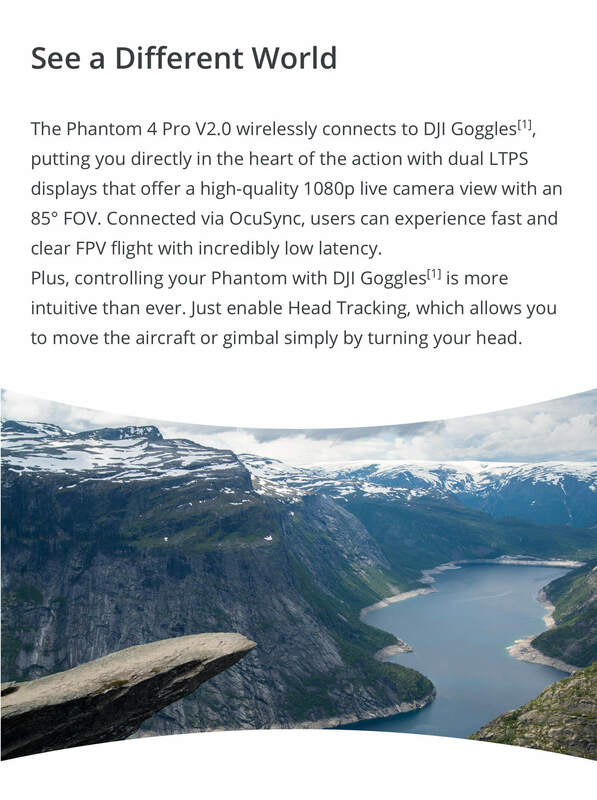 Intuitive control - Take amazing aerial photos using hand gestures, without the need of a remote controller or smartphone. Intelligent flight modes - Quickshot videos with a tap, TapFly to direct the drone where you want, ActiveTrack to stay on target and Gesture Recognition to take selfies or control movement by hand. Edit and share your images and videos straight to social media with DJI GO 4 app. All the items in our website, unless specified, are currently in stock. We keep our stock levels updated on a daily basis. The combo includes: DJI Spark Drone, Remote Controller, Extra Intelligent Batteries (2 Total), 8 Set of props, Prop guards, Charger, Battery Hub, Shoulder Bag.